The spaces I am choosing to compare and contrast are the Sharples Dining Hall lobby and the Lang Performing Arts Center (LPAC) lobby. While both spaces serve somewhat parallel functions—i.e., they are designed to welcome people and guide them into their true destinations within the buildings—their designs and atmospheres vastly differ. The key difference between these spaces is how the form and design of each lobby informs not only the function of the building in which each is located, but also the overall experience that the form gives to the function and thus to the user. Namely, Sharples’ lobby, with its dim lighting and dull buzz of voices, its hefty stone and warm brick-red tile decoration, and its uncomplicated, symmetrical layout enhance the spaces’ overall feeling of protectiveness and coziness befitting a dining hall. Sharples’ lobby is designed to reflect our most basic needs—our need for shelter, our need for food, and our need for the company of others. Conversely, LPAC lobby’s high ceilings and cathedral-like, echoing quiet, its glowing natural light, and its simply adorned white walls and ceiling create an atmosphere of reverence and awe, befitting the lobby’s function as a waiting space for the performing arts, visual arts, and humanities. LPAC lobby is designed to make the user think: where in this building are we going? What part of our brains will we use? 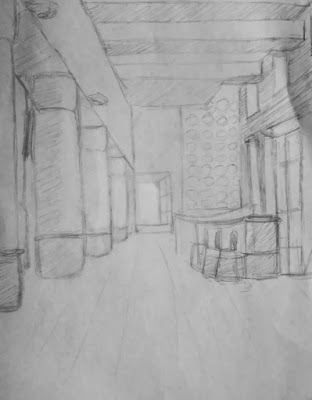 Three key traits define the two spaces: the lobbies’ environments, their approaches to lighting, and their layouts. While their functions are similar, the way each space approaches these three characteristics greatly differs. The first thing you likely notice about Sharples Dining Hall is its shadowy, warmly lit ambiance, facilitated by the generous use of deep brown wood paneling and charcoal gray stone, and the ever-present murmuring cacophony of over 500 voices all talking at any given time. On campus, it is thought to resemble a “ski lodge”; while this moniker may be intended as faint praise, it rather effectively reflects the atmospheric experience Sharples and its lobby are trying to create. Sharples’ lobby is designed to mirror the function of the dining hall. 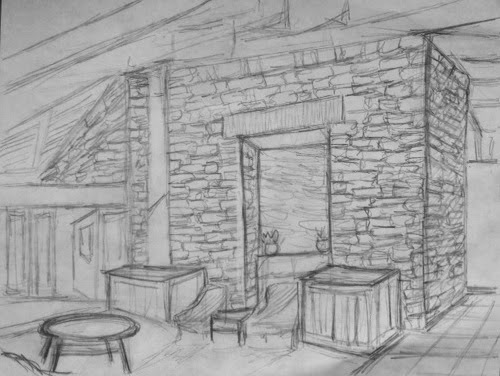 It is meant to preview the cozy atmosphere throughout the rest of the building; like the ski lodge it is thought to resemble, it is furnished with warm colors and strong, heavy stone to give the entrant a feeling of warmth and comfort, a sort of refuge from whatever foul weather may be going on outside. Because there is only one dining hall on campus, Sharples also aims to create a sense of feasting and camaraderie within this fortress of dining, which the design of its lobby previews. The lobby is organized symmetrically; entering from outside, you walk through an atrium, pick up a copy of the New York Times or the Swarthmore Phoenix, and then funnel either left or right to pay or swipe for a meal. The sonic contrast of the space, from the relative quiet and calm of Swarthmore’s campus, to the dull roar drowning out your words in Sharples, hits you immediately; the visual contrast from either bright, fresh green outdoor lighting or gray and gloomy foul-weather light to a consistent, fortress-like cave of a space. Conversely, LPAC lobby’s soaring ceiling, bright natural lighting, reverent quiet and the clean lines of its demure pinkish carpet and smooth white walls serve to prepare you for the variety of stimulating experiences contained within the building. While Sharples’ lobby is built to make you feel to scale, enter LPAC lobby and you feel small in comparison to its lofty ceiling and tall windows. You feel inspired and instilled with a sense of awe and wonder—a good mindset to enter a theater production with. Additionally, upon entering the LPAC lobby, the entrant is forced to make a choice about where they will go from there—unlike in Sharples, the destination is not always so clear and easy. The Sharples lobby has no proper windows. Its lighting is dim, man-made and indirect, emanating from chandeliers or from small obscured ceiling windows. The floor is a brick-red tile tile. The ceiling, which is low and rectangular in the atrium, slopes dramatically upwards as you enter the lobby, yet the low-hanging fans prevent the ceiling from feeling too high. The desks at which the Sharples workers sit, accepting payment, are backed up against a massive gray stone wall that effectively divides the atrium into clear sections and thus divide the waiting diners’ experiences. Standing before the wall, you are not approved to enter the space; you are shut out from the Sharples experience. Once you have paid, you may move past the stone wall, moving through the narrow gap between the stone wall and the wood paneling of the wall opposite, and begin your dining experience. While the stone wall is solid and impenetrable, interestingly, there is a rectangular portal located between the workers’ stations, allowing the people waiting to gain entry a view onto the other side. You enter the LPAC lobby through one of two portals: one, located near Parrish and Clothier Hall, and the other by the List Gallery, across from Kohlberg Hall. No matter what entrance you use, you are immediately greeted with a serene and simply adorned interior and a multitude of potential locations. What is interesting about the entrance by Parrish is that upon entry, you are greeted by windows overlooking the basement dance studios. This view from above into a lower spaces forms an interesting, if likely unintentional, parallel to the view from the Sharples lobby balcony to the dining areas below. Another quality that distinguishes LPAC lobby from the Sharples lobby is the vast difference in the use of light. Sharples is notorious for its lack of natural light and its subsequent use of chandeliers to attempt to make such a dim space illuminated. The use of dark wood and stone in Sharples’ walls adds to the overall subdued lighting. Where Sharples’ walls are dark with wood or stone and heavily textured, creating a cavernous feel, the LPAC walls are designed to be as unobtrusive as possible to emphasize the airy quality of the space. Most importantly, the walls by the stairs down to the dance studios in the basement feature generous floor-to-ceiling windows that overlook the greenhouse across the way. Lang Performing Arts Center Lobby. In the Sharples lobby, an emphasis on symmetry marks your journey. Past the pay stations, the space is equally symmetrical, with matching niches stocked with couches overlooking railings, all leading to a balcony parallel to the stone wall. In front of the balcony is a symmetrical double staircase, while perpendicular to the balcony are two high wooden walls concealing matching private dining areas. As a rule, it seems, high dividing, guiding walls are a strong running theme throughout the Sharples lobby. While the Lang Performing Arts Center’s lobby ostensibly serves a similar purpose as Sharples’; i.e., to be a place for people to wait, the architectural features of the space also relate the LPAC’s form and function in an effective way. Enter Lang Performing Arts Center and your engagement with its lobby is an entirely different experience. Where Sharples’ lobby is dimly, unnaturally, indirectly lit, the LPAC lobby is flooded with light and views of the surrounding greenery via large windows. LPAC also features white, smooth walls and ceilings that reflect and contain the natural light. Where Sharples’ lobby is rigidly symmetrical, the LPAC lobby’s symmetrical entrances into the main stage theater are broken up by the asymmetrically placed entryways and the staircase leading to the lower level. Your path through the Sharples lobby is clearly indicated; as you enter LPAC’s lobby, conversely, it is not immediately obvious where to go. LPAC lobby feels endlessly open, spacious and airy, with its uniformly high ceiling and wide lounging and waiting area. Sharples’ lobby itself is small in size, with a ceiling that gradually slopes from low to high. When you enter Sharples’ lobby, the building is built to your scale. You do not feel dwarfed or made smaller by the architecture. Its symmetrical layout makes it uncomplicated; its division of space directs you where to go without too much deliberation on your part. People often go to Sharples exhausted, on too little sleep, and the simple layout of the lobby facilitates an easy entrance into the dining space. In the summer, Sharples Dining Hall and its cavernous design seem less than appealing. However, in the winter, when the weather turns unpleasant, Sharples’ “ski-lodge” atmosphere and substitution of chandeliers for natural light arguably drives home the building’s own style. Sharples is the sole dining hall on campus, and it is thusly important that it feel welcoming and homey, a welcome social and food-related refuge from your work or from the weather. Whereas Sharples lobby funnels you through two channels into the dining space, in LPAC lobby your path throughout the space is more ambiguous, due to the slightly subverted symmetry of the entryways and of the directionality of the spatial components. Do you want to go into one of the two theater doors? To the List Gallery? Do you want you go into the basement dance studios? Or do you want to climb one of multiple staircases to an upper level, where the English department is located? Whereas the rigidly symmetrical Sharples lobby is designed for reacting and for fulfilling basic needs, such as hunger and the need for shelter, LPAC lobby is designed for thinking and choosing what experience you wish to have, such as taking in theater, viewing art, participating in dance, or studying English. what if I want to dance in sharples? or eat in lang? Just kidding! Nice analysis...it is interesting to think about design and function in this way!